Providing you the best range of powder dyes, kesari powder dyes, mahagony powder dyes and polish powder dyes with effective & timely delivery. 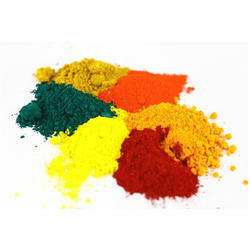 We are among the acclaimed names in the industry for manufacturing and supplying Powder Dyes. The offered dye is formulated from high-grade inputs and is extensively demanded for coloring paper, textiles, ink, ceramics, tiles and bricks. This dye is characterized by uniform sized particles, resistance to degradation in presence of chemicals and high thermally stability. We are among the trusted names in the industry for manufacturing and supplying Kesari Powder Dyes. The offered dye is made from high-grade inputs for offering superior grade products to clients. It is resistant to chemicals, non-reactive to alkalis and eco-friendly as well. 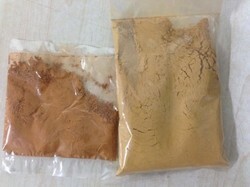 This dye is demanded owing to its fast coloring property and longer shelf life. 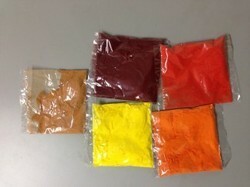 Our organization has set a benchmark in the industry for manufacturing and supplying Mahasony Powder Dyes. The offered dye is used as a coloring agent is civil engineering, paints, ink, plastic and textiles industries. It is available in a wide range of colors for meeting the various requirements of the clients. This dye is resistant to heat and non-reactive to alkalis as well. We are operating as a leading manufacturer and supplier of Polish Powder Dyes. The offered dye is used for polishing wood in the furniture industry. It is easy to apply, resistant to heat and non-reactive to chemicals including acids & alkalis. This dye is formulated in tune with the industry standards and has earned us loads of profits and appreciation.